Andrew Lamar Alexander, Jr. (born July 3, 1940) is an American politician. He is the United States senator from Tennessee since 2003. He is a member of the Republican Party. Alexander last served as the conference chair of the Republican Party in the US Senate from 2007 to 2012. In December 2018, Alexander announced his retirement from the Senate by ruling out a re-election bid in the 2020 race. ↑ "Alexander wins Senate GOP Conference chairmanship - POLITICO Live - POLITICO.com". politico.com. Retrieved 12 January 2014. ↑ Finding Aid for Governor Lamar Alexander Papers, 1991. Retrieved: 3 January 2013. ↑ "Meet Lamar - Home - Lamar Alexander: Conservative. Solving Problems. Standing up for Tennessee". 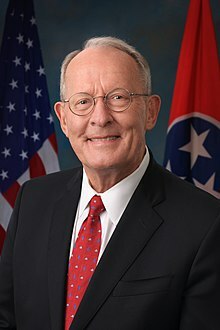 lamaralexander.com. Retrieved 12 January 2014. This page was last changed on 3 January 2019, at 18:00.